You might have noticed that last week Sugar Dish Me got something of a face-lift but I didn’t really explain it and instead told you stories about my mean cat and the Christmas boxes that I finally finally shoved into a closet. I’m sure you are all incredibly organized and together and don’t know anything about stuff like that. So anyway– blog makeover! Let’s discuss. In September 2012 I set things up the way you’ve grown used to seeing them (big ‘ol clunky photo banner across the top and all). I am not a computer programmey kind of person – I love book stores and libraries and stationary!!! So when I was in school I totally resisted all things technology related, much preferring pen to paper. Trying to navigate the back end of a website is complicated you guys. And most days I just want to cook, make the food look pretty for a few photos, and write. So every time I needed to do something technical it would take me all the live long day. You would probably laugh at me with my stacks of composition books all spattered with frosting, loaded with lists of ingredients and recipe scribbles, with random bits of techno-code stuffed in between while I tried to figure out where to place html and numbers and other un-food-related garbledy gook. I was ready for a change — I needed things to run more smoothly. I needed you guys to be able to figure out how to contact me, use your recipe box, or find something in the archives easily. And I needed a set of fresh eyes. I hired someone awesome that knew what in the world she was doing to fix it all and make it look pretty. Whew! That was a load off my mind. Web design and all the things that go into it is a skill I do not possess. And I’m good with that. I really just want to feed you anyway. I hope you like the changes! I could not be more happy. 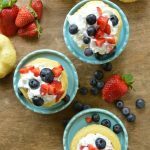 I am in the middle of revamping the Recipe Index so it’s easier to find everything with pictures! instead of a big long eye-straining list of words. And I made you spaghetti. 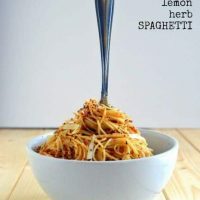 This Easy Lemon Herb Spaghetti is a really fast meal that will make everyone in your house so happy! With a few fresh ingredients you can have dinner on the table in a super flash. It would be amazing with some sliced chicken or shrimp on top, but I just enjoyed it as-is with a big green salad and a glass of wine. Yum. 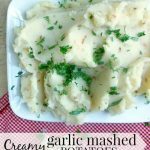 I wrote this recipe with winter in mind so I used dried herbs but if you have fresh herbs on hand they would be totally delicious! I would opt to add fresh herbs at the end instead of to the toasted breadcrumbs because … well because they are fresh herbs. I also chose to use extra virgin olive oil with mine because this dish is sooo simple it gives great ingredients a chance to shine, but regular olive oil will work just fine. 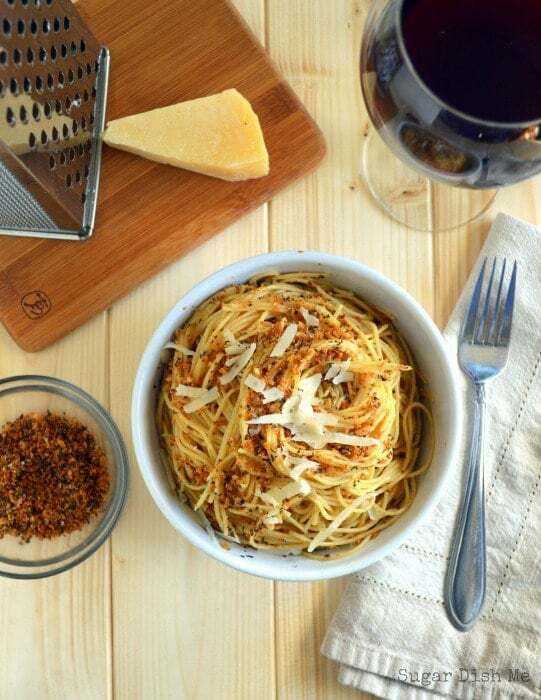 Fresh and simple pasta tossed in garlic-infused extra virgin olive oil, fresh lemon juice, basil, oregano, a dash of crushed red pepper, and toasty panko bread crumbs. Cook the pasta according to package instructions for al dente, reserving 1/2 cup of the liquid from the cooked pasta when draining. While the pasta cooks, pour the olive oil in a small saucepan. Add the garlic and cook over medium heat for a few minutes until the garlic JUST starts to turn golden (more than that and the garlic will burn and taste bitter). Remove from the heat. Slice the lemon in half and squeeze the juice into the oil, being careful not to get seeds in it. Toss the drained pasta with the garlic lemon oil. Add a little of the reserved pasta water to help move things around in the pan and coat the noodles evenly. Place the small pan that you heated the oil and garlic back on the burner on low heat. Add the Panko bread crumbs to the pan and stir them around a little to toast them. Watch the breadcrumbs closely! Toasting them only takes a minute and they will burn if you aren't careful. Add the dried basil, oregano, kosher salt, black pepper, and red pepper flakes to the breadcrumbs. Toss to combine. Stir the breadcrumbs into the pasta. I like to save a few to sprinkle on top of each serving. Garnish with the cheese and serve. 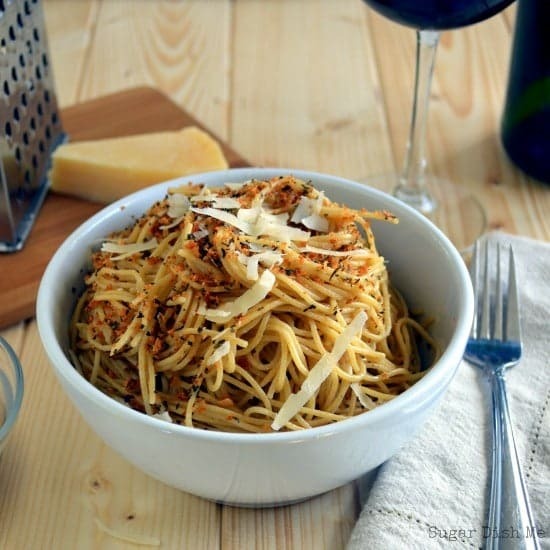 LOVE the site, LOVE your photos and LOVE this spaghetti!! Bellissimo!! You are SO nice 🙂 Thanks Tanya! Thanks so much for the invite! Have a great weekend! LOVE this new look. So clean and crisp! And the spaghetti looks to die for too! 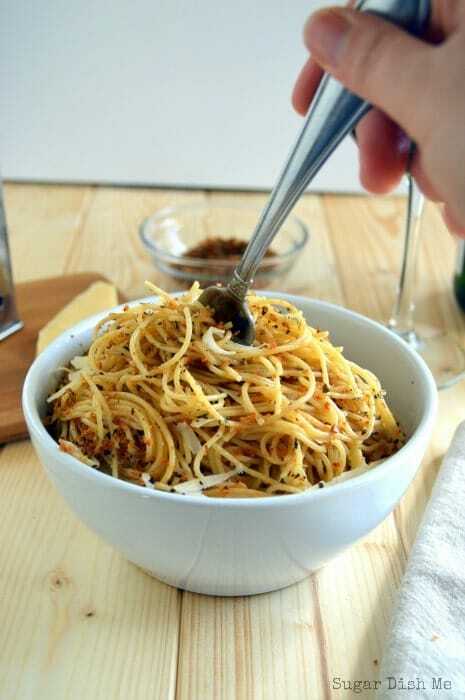 This spaghetti looks amazing! I feel like I haven’t had any good pasta in a really long time and that’s something that definitely needs to change. I’ll have to try this when I’m home from school :). Yes. Make the pasta 🙂 You have to have really good pasta every now and then. Your stomach will thank you. Thanks Rebecca!!! haha thank you! I had fun taking that photo. Love the site redesign, the techie stuff always wears on me too! But the finished product looks awesome! 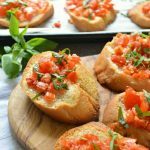 This recipe sounds delicious, I can’t totally see myself eating this with fresh herbs and glass of white wine! YUM! Pinning! Thanks so much Krista! Pasta, fresh herbs, wine — yes to all of that! Spiffy!!! Thank you Andi! That first photo was so much fun to take. I think it’s my favorite so far this year! In crazy love with this, like wildly in love YUM! 🙂 Thank you so much Pamela!!! Hi Heather! 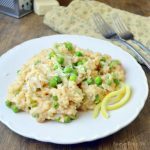 I’m going to try this recipe tonight but have a question. On step 4, where you add the breadcrumbs, basil, oregano, etc……is the pasta in the pan as well? Or is that sitting to the side and you add the breadcrumb mixture to it? I know that seems like a silly question but after step 3 I wasn’t sure where the pasta went. Thanks and can’t wait! Hi Lacey! No, the pasta is not in the pan. 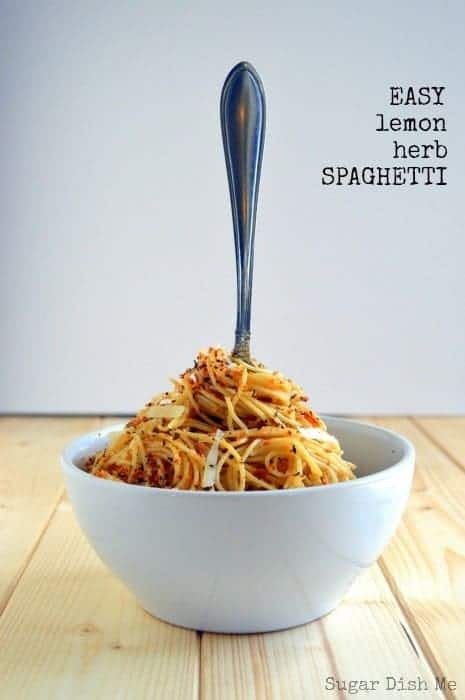 You’ll cook the breadcrumbs and herbs separately and then toss them with the spaghetti. Let me know how you like it! We just had it for dinner again the other night! oooohhh I need to check on the Kindle saving! I do love my Kindle. 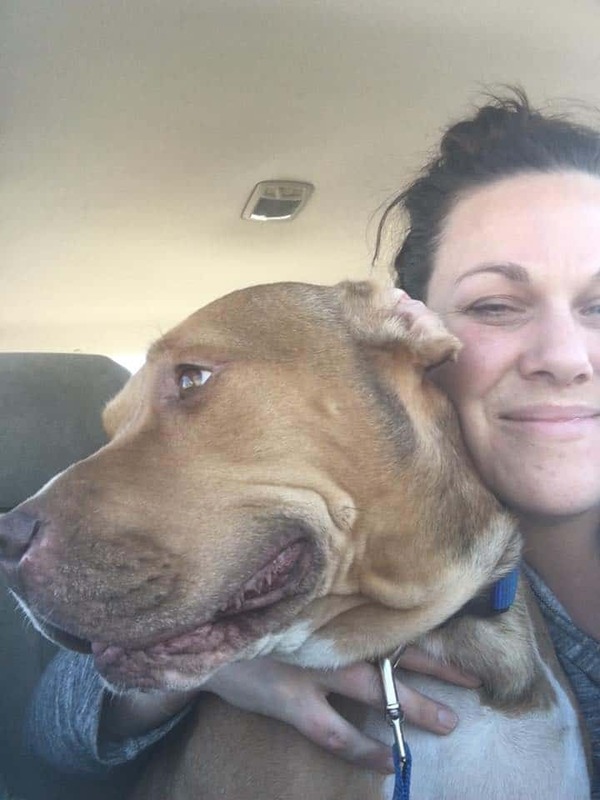 Thanks so much Kristin Nicole! Oh No my computer was acting up and posted my comment like 3 times. SORRY! If you can please delete 2 of them… 😉 thanks. Haha Kristin — no worries! After making this dish with two other friends, we all sat down just to find that it was horrifically bland, it was hard to finish.